I seriously don’t know where the time went, but baby boy is now a big boy and just had a birthday. 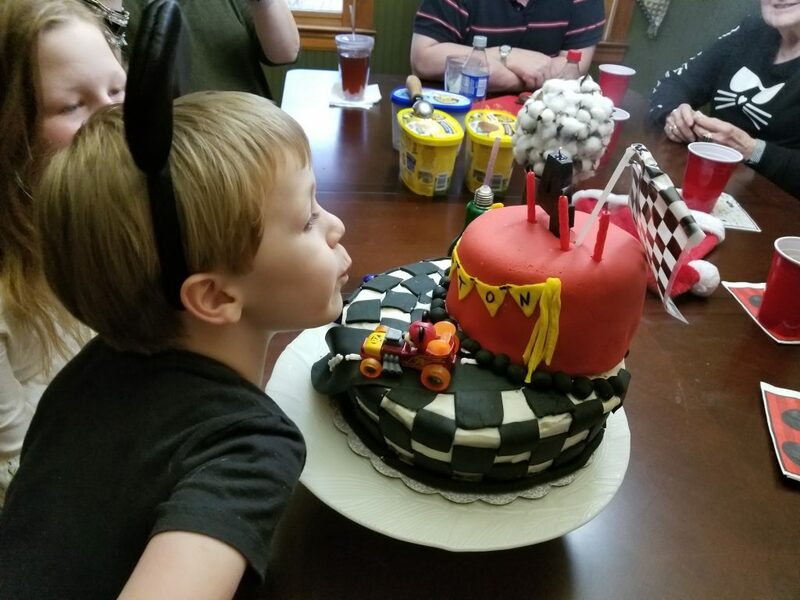 Oh my, he was adorable – who isn’t when they are 4 and have a whole day just for them? This year, he requested a Mickey Mouse party, and I was only too happy, being the Disney-holic that I am, to oblige. 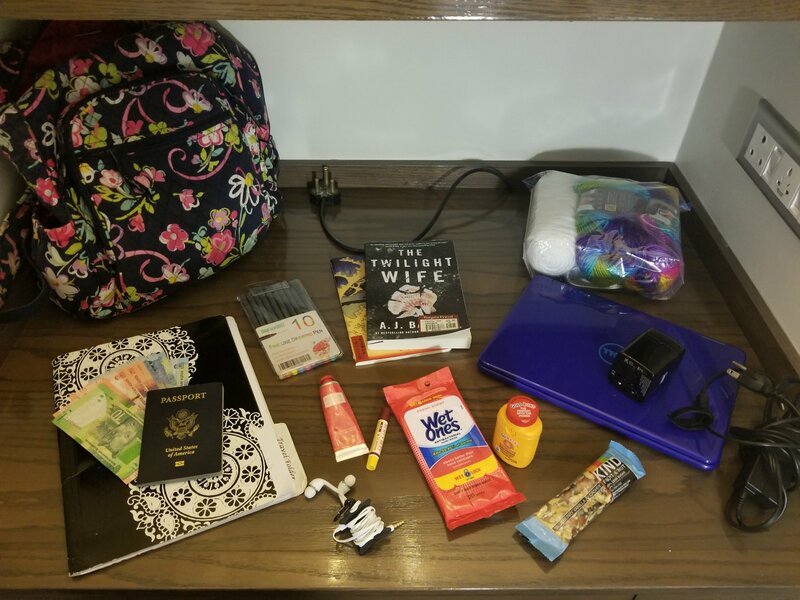 We’ll start with the simple items on the menu. This year, we didn’t do a full meal, just heavy appetizers and cake and ice cream. It really wasn’t overwhelming this year as only about a dozen family and friends were coming. Before we start, no, not EVERYTHING was Mickey shaped – almost everything – but not everything. We had a vegi tray, cocktail wieners, and a couple of other items that didn’t look suspiciously mousey. 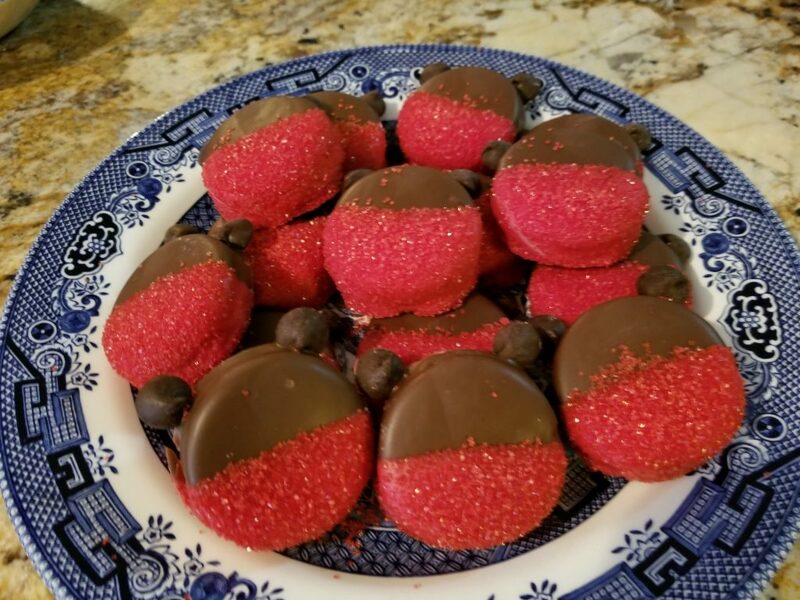 There were two very easy, and very cute sweet treats I made. The first is perfect for any salty and sweet lover in your family. 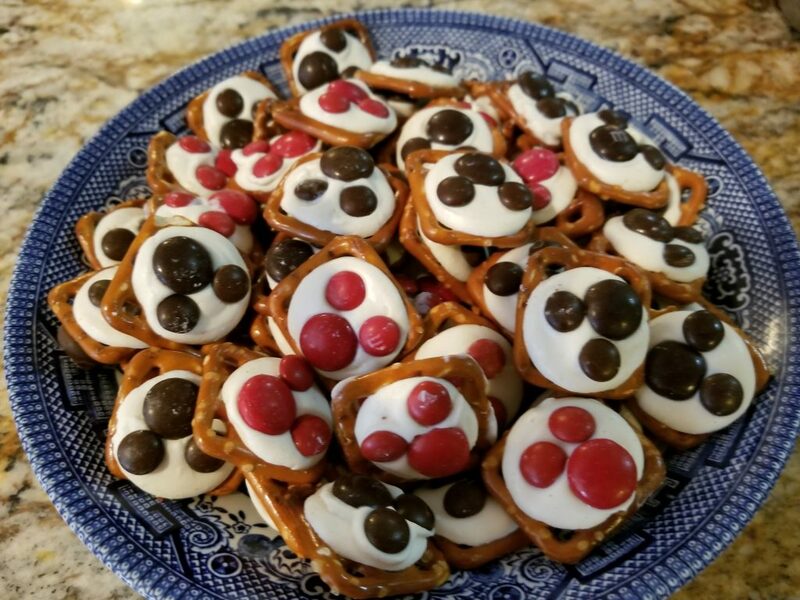 Instead of the traditional square pretzels with melted Hershey’s kiss and Christmas M and M in the middle, I put white melting chocolate on the pretzel and then used red and brown regular M and Ms for the head and M and M’s minis for the ears. Make these in small batches, the chocolate wafer will cool quickly. 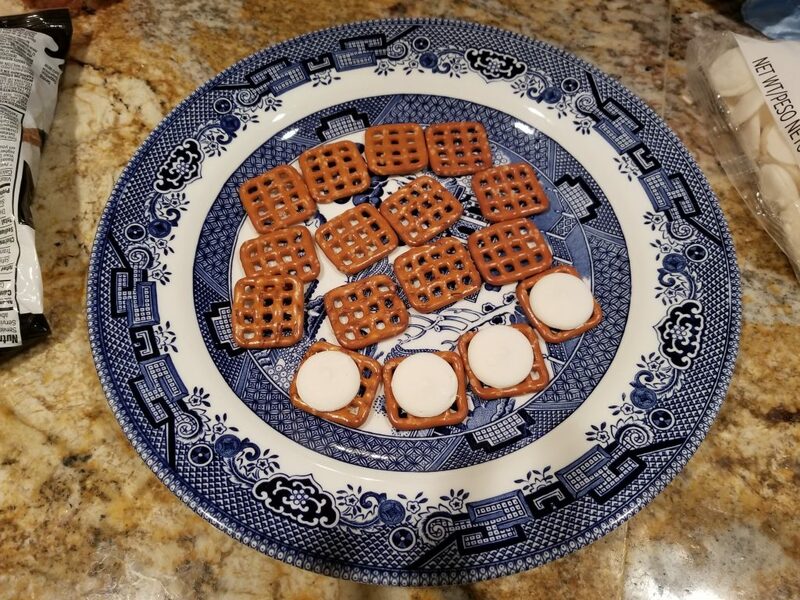 I simply placed the chocolate wafer on top of the pretzel and microwaved for 30 seconds – much more than that and the pretzel burns. If you need to pop it in a bit longer, do it in increments of 5 to 10 seconds for safety. Chocolate is great, unless it is super-heated and sticking to your skin like edible super glue. 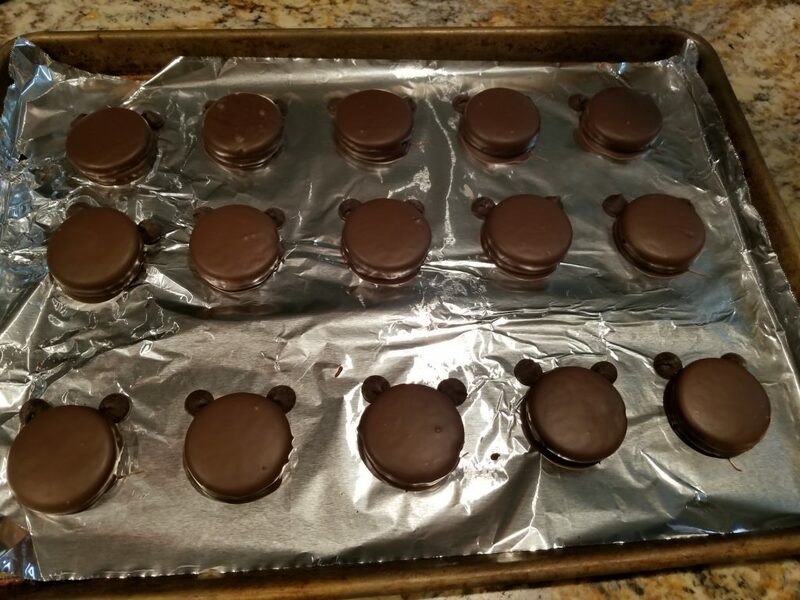 The Mickey cookies I made were also super easy. Start with Oreo or other like cookies and be prepared to eat a couple along the way – dangers of using Oreos and all. 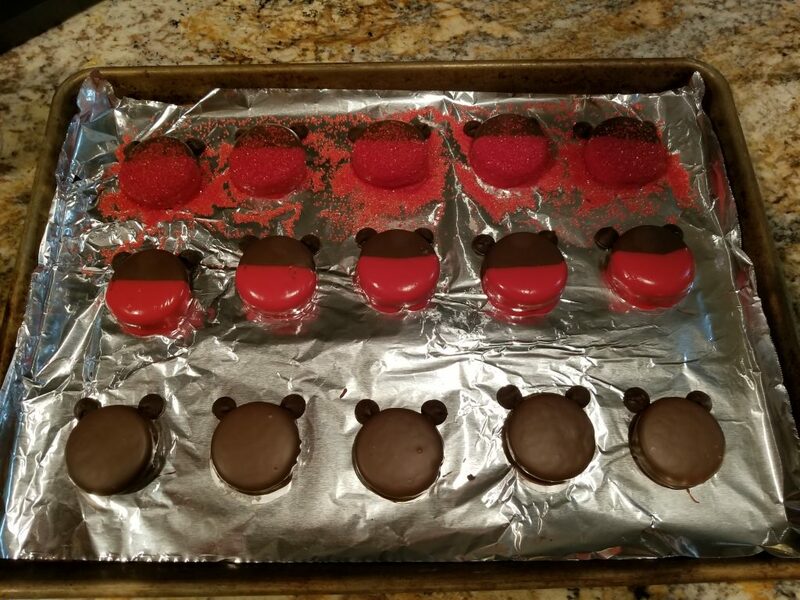 I started with the red melting chocolate and dipped the bottom half of each cookie in the chocolate to form Mickey’s pants. I then covered with red sanding sugar for some sparkle. His ears were jumbo chocolate chips that I dipped in regular chocolate and attached to the base Oreo while the red was setting. Pop them in the fridge and you are ready to go. Be careful taking them off the pan and putting them on your plates as the ears are really easy to pop off. 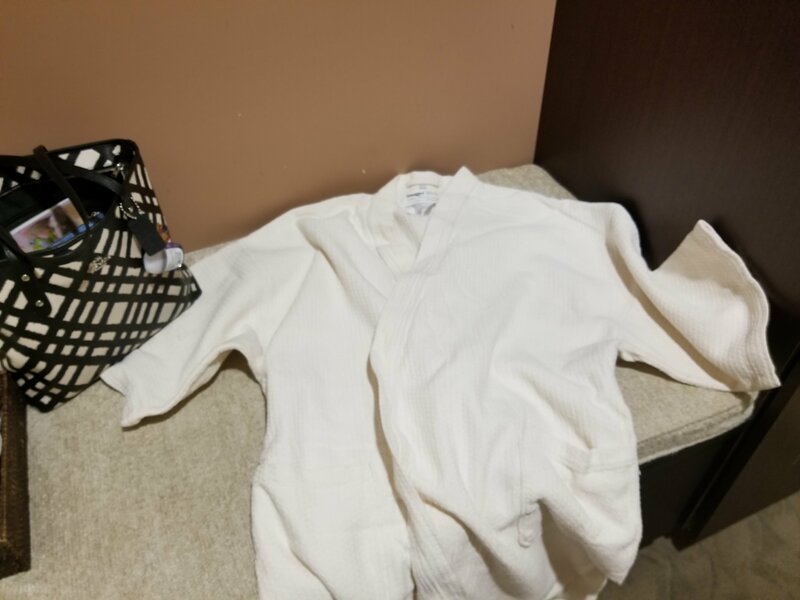 You can reattach and set again if needed, but give yourself some time so you can. 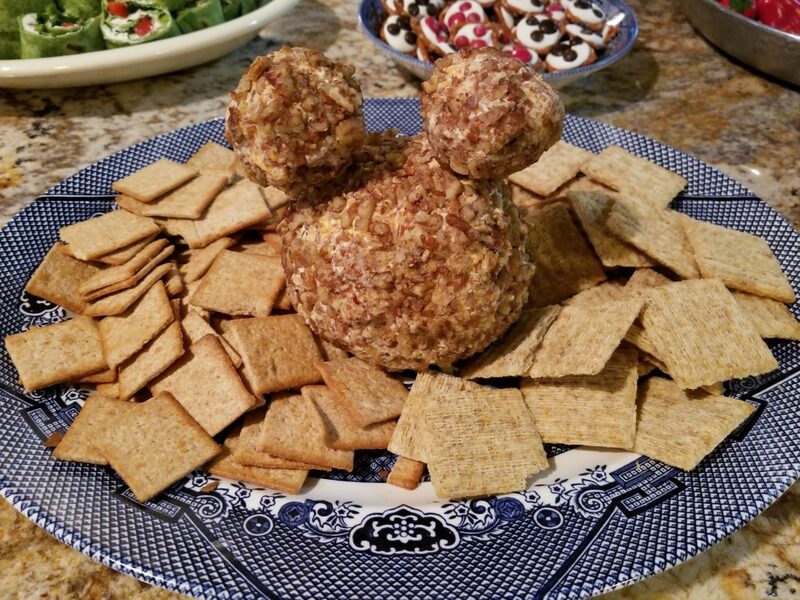 This is my all time favorite cheese ball recipe. I don’t know if you are aware or not, but cheese balls are a Southern go to. No baby shower, holiday party or work gathering is complete without one – and there is a trick to making them the day before so that the flavors can have time to merge before you serve it – and serve it at room temperature, not straight from the fridge. In a large bowl, mix all ingredients except pecans and shape into a ball. Go easy on the hot sauce – you want three or four good splashes, but not enough to make it combust on its own. This will make 1 large ball or 2 smaller balls. Once you have a sufficiently round shape, roll in finely chopped pecans. Wrap tightly in seran wrap and store in the refrigerator overnight. This is an insanely good mix, and has a lovely garlicky, vegi essenced flavor and nuttiness of the pecans, really bringing out the sharpness of the cheese. Serve it on a cracker with a mellow flavor profile – you don’t want highly flavored crackers competing with the cheese ball. Try Wheat Thins or a plan Triscuit that has a wheat based flavor and a little sturdiness to it. These fun little pizzas are easy and adorable. I used Naan dippers from the deli section of my local grocery store as the crust – they are pre made and super yummy. 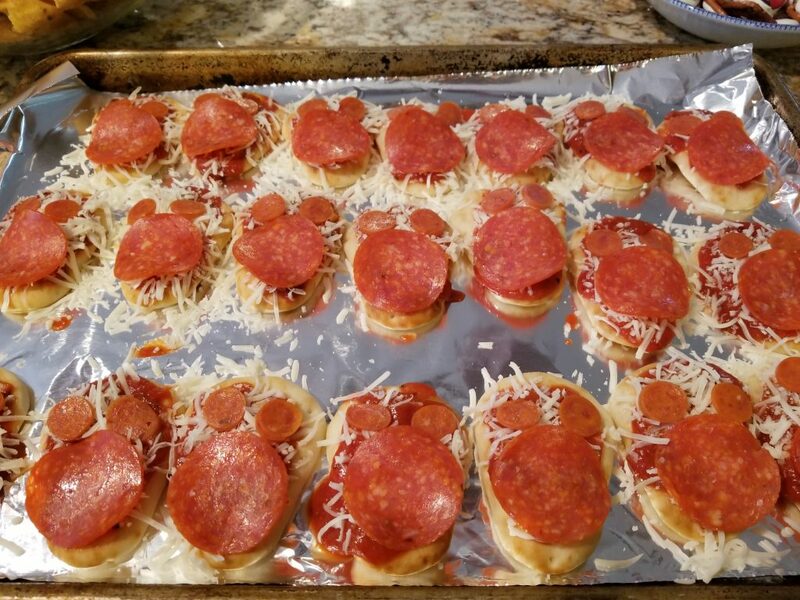 I topped with pizza sauce, mozzarella cheese and regular sized and mini sized pepperonis for the little ears. Bake at 350 until the cheese melts and you are all done. You can whip up a ton of these tiny treats in no time! Now this you can’t whip up in no time. 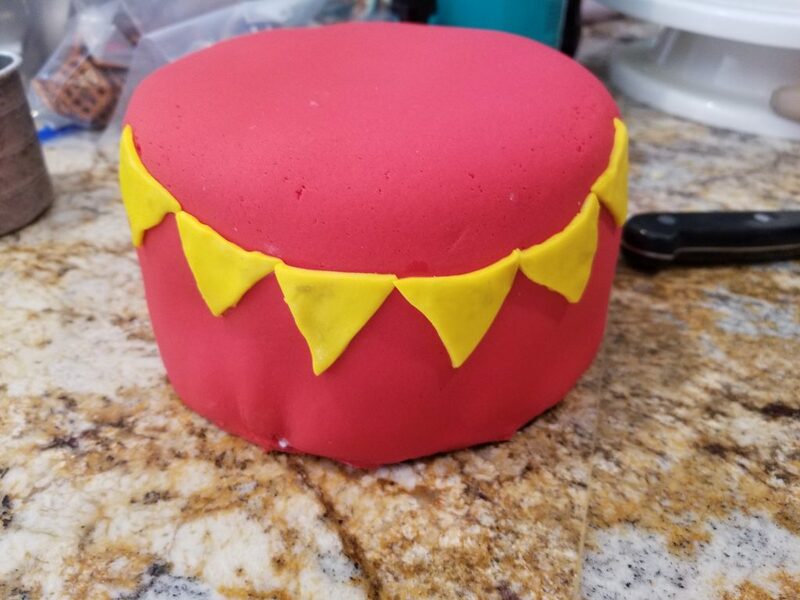 When I make a party cake (check out my Pokemon and 21st birthday party ones too!) I like to start one to two days before to give myself enough time to mess up and regroup. Yep – it always happens and there is nothing like a close call to help you remember that little lesson. Use your favorite cake recipe and make a double batch of batter. 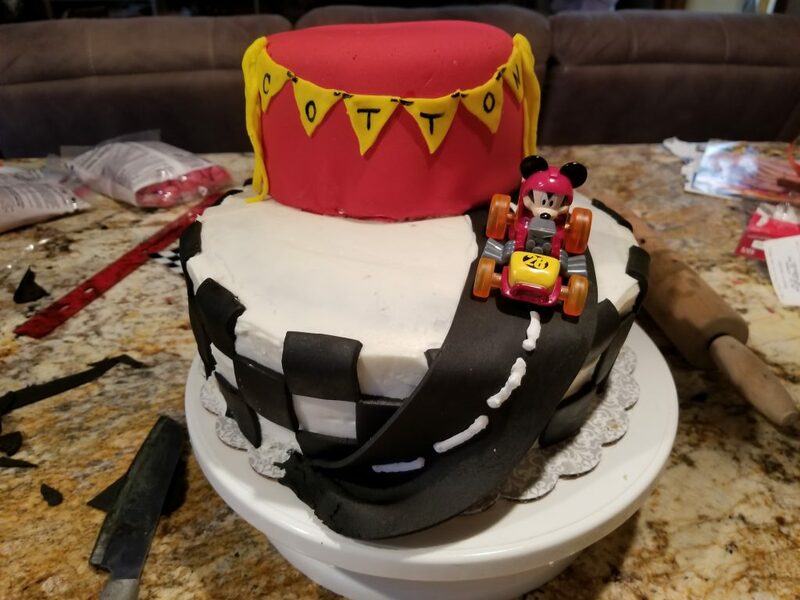 This cake looks more complex than it is. Start by baking your cake layers until they are done but not over cooked – you don’t want them to have a chance to dry out too much. Let them cool completely. Assemble into bottom – 10 inch layers – and top – 8 inch layers. Frost with White frosting and set aside – this will use most of your frosting. 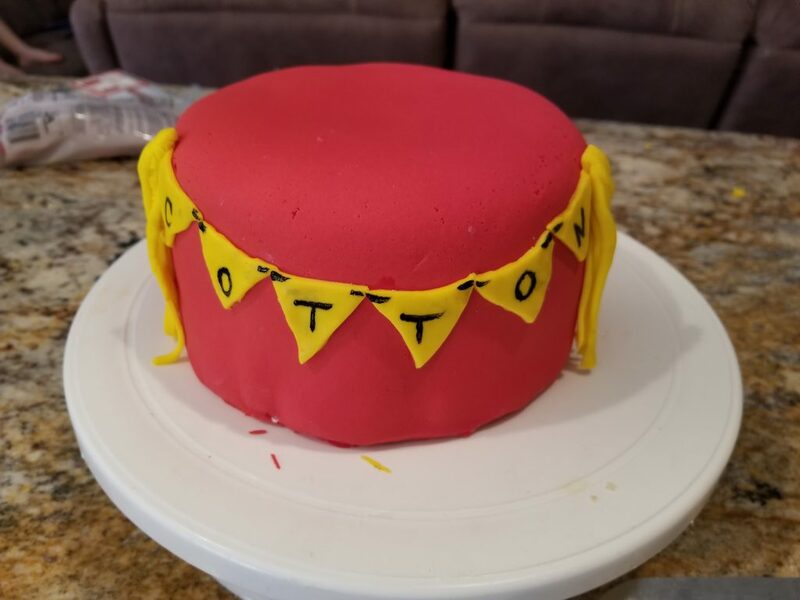 The top cake is covered in red fondant. 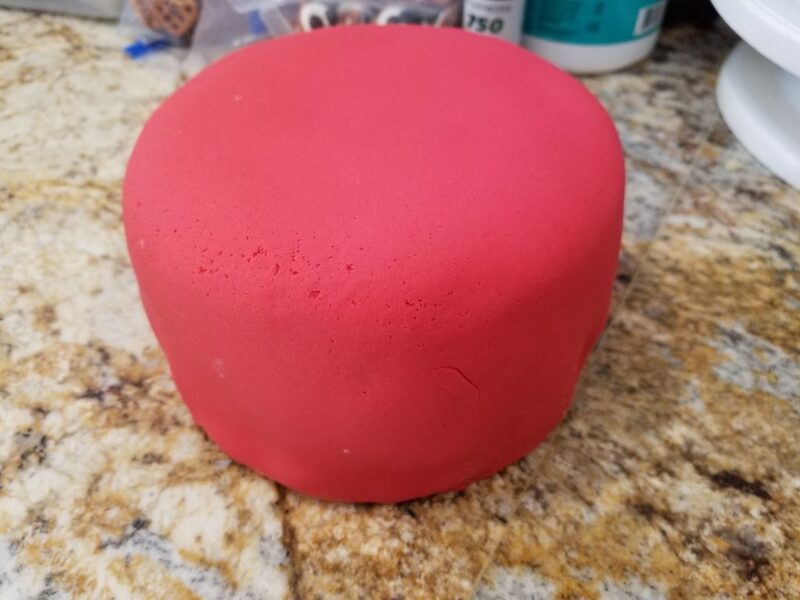 Simply roll out fondant (about three times the size of the cake). 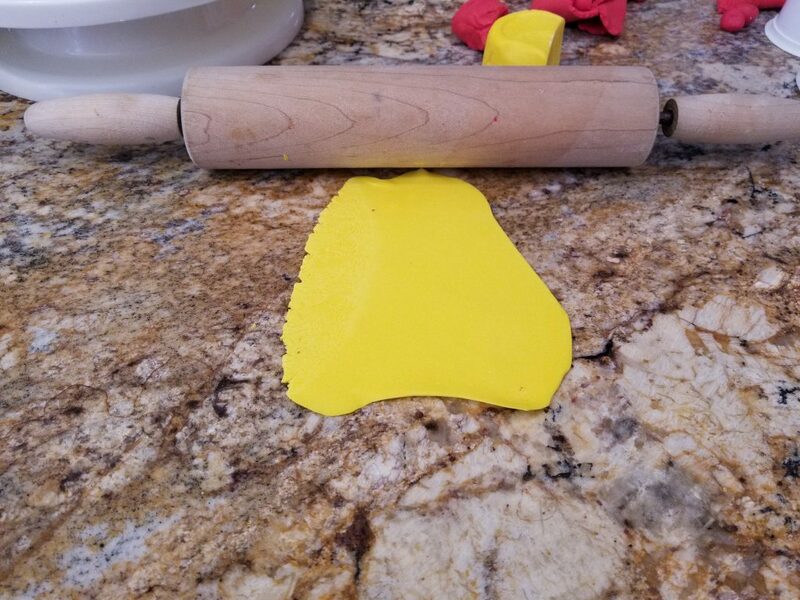 Starting at one side, roll fondant onto your rolling pin and transfer to cake layer – center as you are rolling it out. 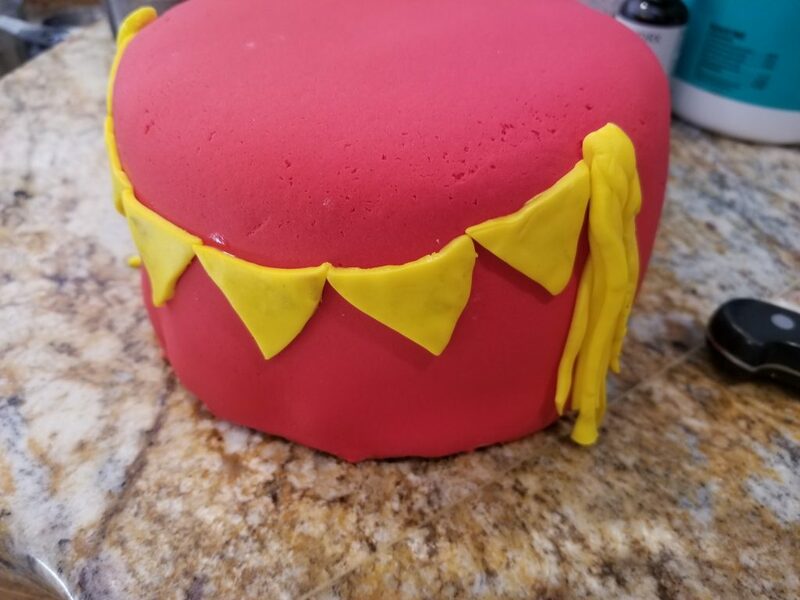 Using a fondant smoother, smooth the top and work your way around the edges of the cake. Trim excess as you go. Continue soothing until there are no creases or folds. 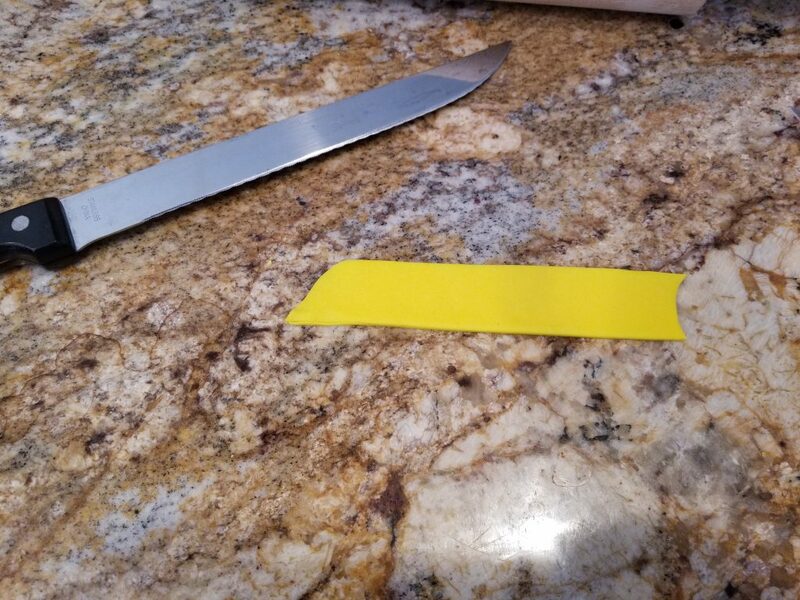 The yellow fondant can then be rolled out and cut. I used a ruler as a straight edged guide for cutting the flags. 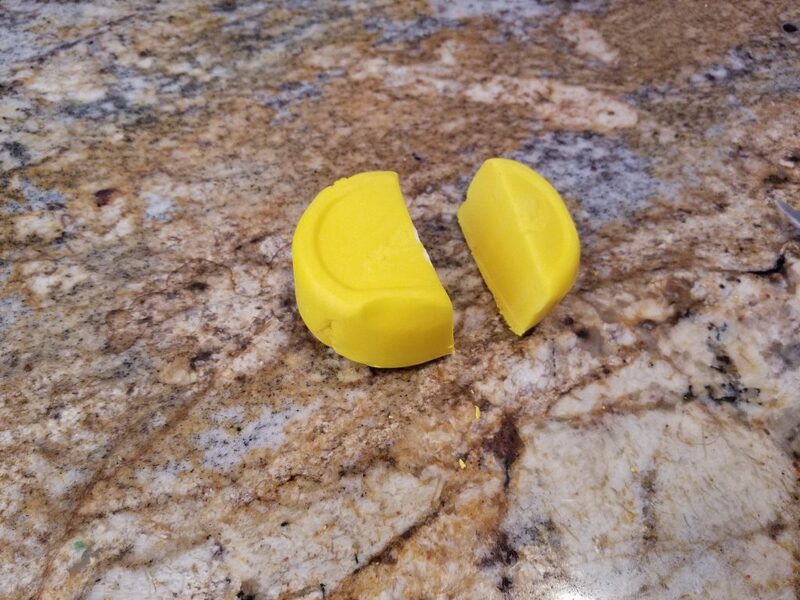 I cut a one inch tall and 8 inch long rectangle from my yellow fondant. Once the rectangle was free of any excess, I simply free handed 1 inch cuts to create squares, then cut the triangles from those squares. Easy breezy. Who said I wouldn’t use Geometry in my adult life? 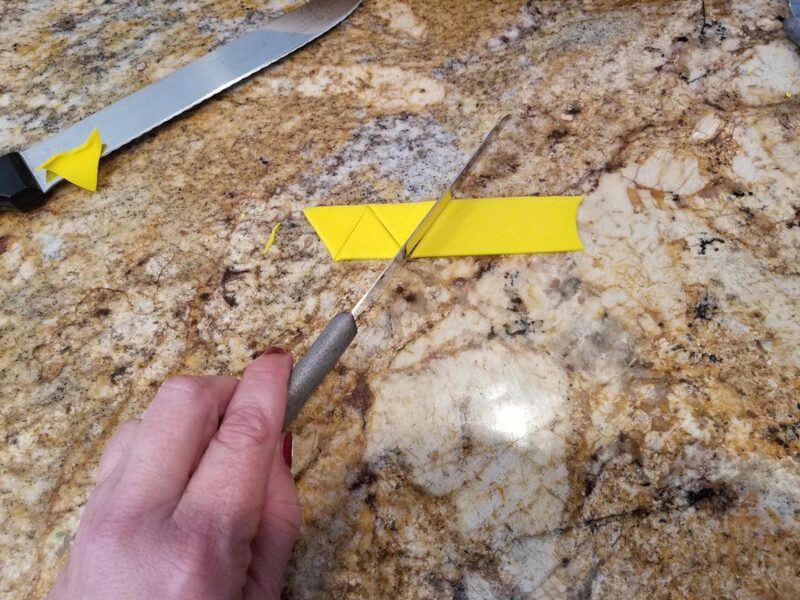 Run your knife under each flag (triangle) carefully, rub the back with water and apply it to the red fondant on your cake. Make the flags curve like they would if they were hanging over a finish line. Once secure, using a toothpick, make an indention in the top two points and connect with black gel food coloring (draw a line from one flag to the next to simulate the string that would hold it. Using a paint brush, paint the letters directly onto the flags. The bottom layer is made much like the top. 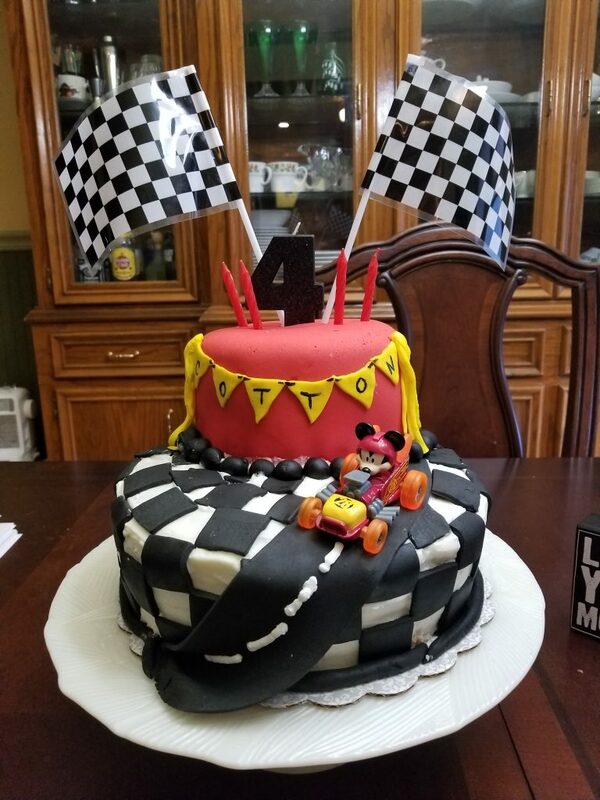 I cut 1 inch strips from my black fondant and positioned them in a checkerboard pattern directly on the cake. They adhere easily because of the frosting. Continue creating your pattern until you have covered the whole cake. Every cake has a back – whether you want it to or not – so if it overlaps a bit where they meet, don’t stress. 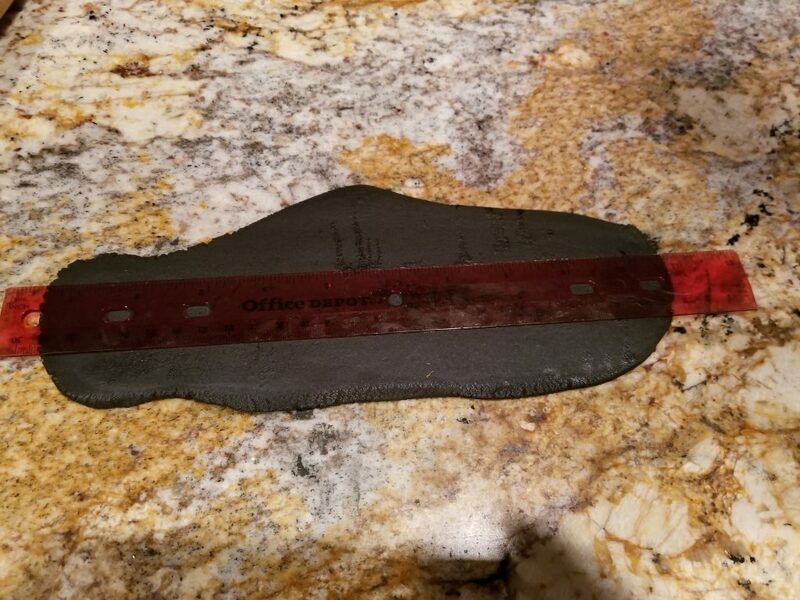 The road was a three inch wide, 15 inch long rectangle of black fondant that I placed on the cake and gently sloped around the side. Tuck it in and move on. You don’t have to have a drivable surface here. Make the lines in the road by piping on a little white frosting. Position (the insanely intensely faced) Mickey up top (if that is your child’s favorite character) and Donald at the bottom. 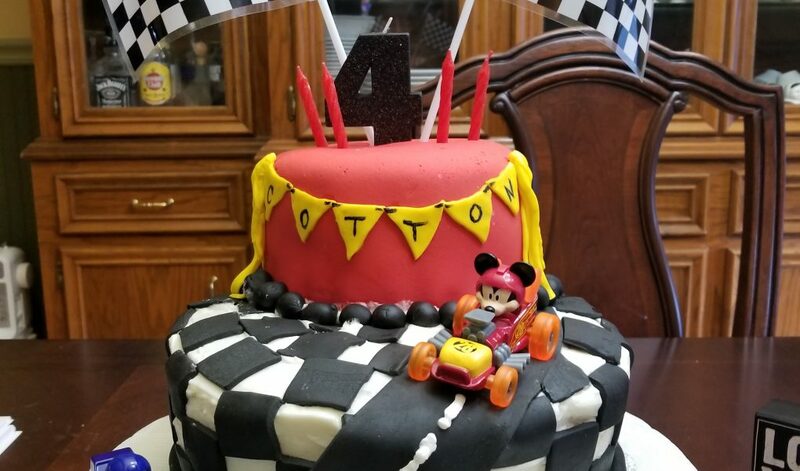 The top layer is graced with the two racing flags and candles. 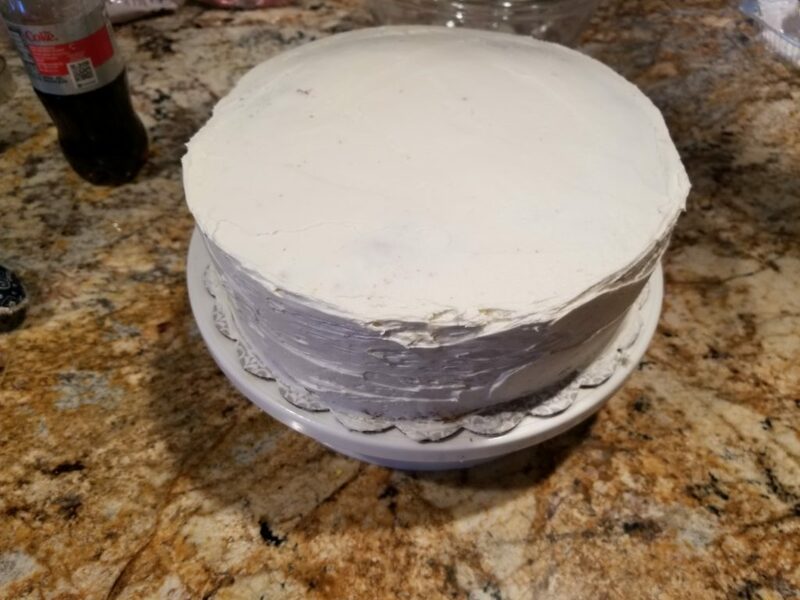 This cake was a little heavier than I thought it would be, so I did use some skewers (cut to size) under the top layer to provide a little structural support for the top layer to sit on. You may or may not need this. 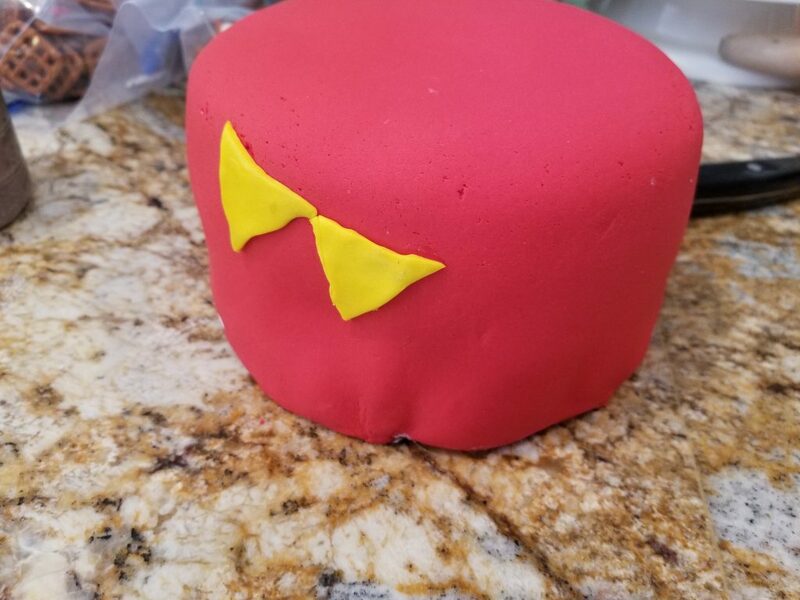 Finish the cake edges by adding balls of fondant like I did or pipe a red, black or yellow icing border. Teeny absolutely loved it! Be sure to put it out of reach if you are storing it over night – it is hard for tiny hands to resist! This is a LOT easier than it looks. Let me know if I can help. This was so much fun! We love Mickey here!!!! Anything Disney really! These are all awesome ideas! 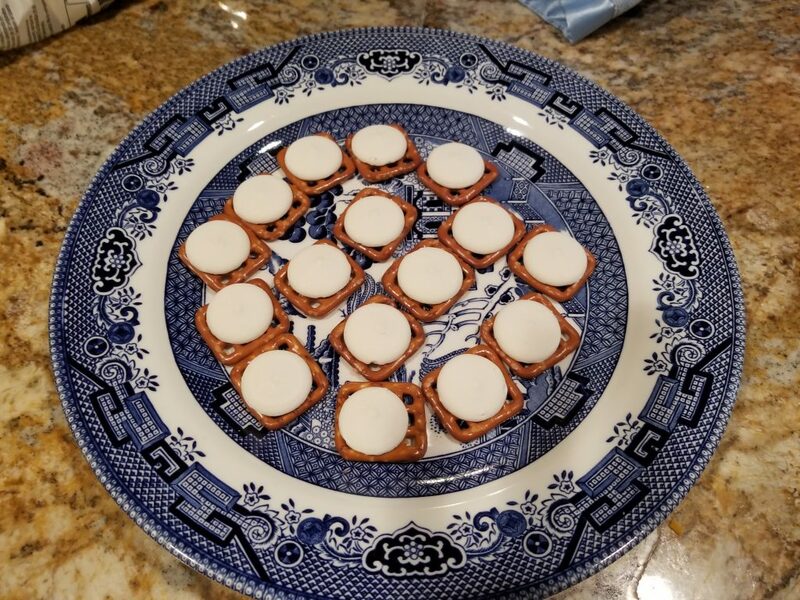 Are you going to post any cool super bowl snacks? Absolutely, I will have them on the blog in Tuesday! I do love a theme!